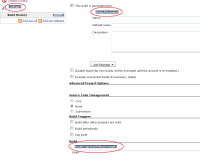 Installing Parameterized Trigger Plugin 2.8 on Jenkins 1.417 leads to errors (some areas of text where the background turned grey) on the configuration page of a job. Deinstallting the Parameterized Trigger Plugin and the grey background disappears again. Is this really a blocker? Also, please add additional information - i.e. screenshot, link to the mailing list archive of the thread where this was discussed. kutzi added a comment - 2011-06-26 14:37 Is this really a blocker? Also, please add additional information - i.e. screenshot, link to the mailing list archive of the thread where this was discussed. Tried it again on a different computer and can't reproduce it myself. On the computer it appeared the first it's still there and could be reproduced by installing/deinstalling the Parameterized Trigger Plugin. They are both Windows Vista 64 bit running excactly the same plugins (copied from one computer to the other). I'll ask our administrators to reinstall the one it happened the first from scratch. Sorry for any inconvenience. But I still can't build the Parameterized Trigger Plugin against Jenkins 1.417. There is one warning about deprecation and all tests run into errors. But that's a different problem. So I'll close that one here. Maik Richey added a comment - 2011-06-27 07:24 Tried it again on a different computer and can't reproduce it myself. On the computer it appeared the first it's still there and could be reproduced by installing/deinstalling the Parameterized Trigger Plugin. They are both Windows Vista 64 bit running excactly the same plugins (copied from one computer to the other). I'll ask our administrators to reinstall the one it happened the first from scratch. Sorry for any inconvenience. But I still can't build the Parameterized Trigger Plugin against Jenkins 1.417. There is one warning about deprecation and all tests run into errors. But that's a different problem. So I'll close that one here. Can't be reproduced on a different computer. See my last comment. Maik Richey added a comment - 2011-06-27 07:26 Can't be reproduced on a different computer. See my last comment.